"A meeting was held in the South Cerney Village Hall on October 22nd 1935 to consider the formation of a "Drama Group". Miss Brinsford, Miss Cripps, Mr. W Cripps, Miss S. Evans, Miss W. Fox, Miss M. Johnson, Miss G. Johnson, Mr. A. Parsons, Mrs. Smyth, Miss M. Wheeler, Miss G. Yeatman, Mrs. Peach." 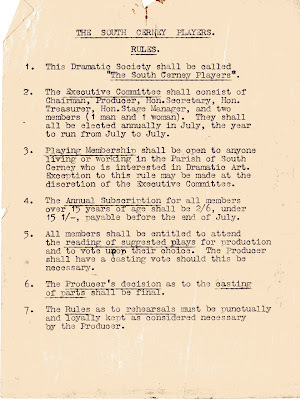 The text above is from the inaugural meeting of the South Cerney Players. The scanned images are taken from the Minutes Book and are a little faded and suffering from someone's well intentioned attempts to keep the pages together with sellotape. Nonetheless, it is the earliest record located so far. 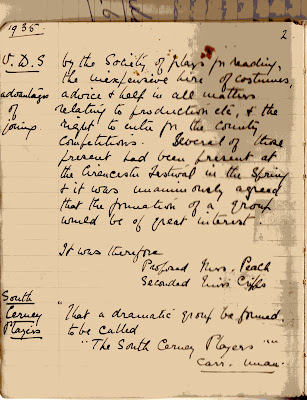 An early recording of a South Cerney Players production/rehearsal in 1937 - "On Dartmoor"
2011 was the 75th anniversary of the first production by The South Cerney Players. My how time flies! Acknowledging 75 years of the Players was an on-going event in 2011. One such event was held at The Village Hall on Saturday 2nd July 2011. A report published in the Standard is reproduced here.